A few months ago, I received the unlikely gift of a box of moose meat from B., a reader in Wasilla. Little did she know it would sustain me for such a very long while. As I hadn't been feeling that well at the time it arrived, I kept saving the moose for just the right occasion. After all, how often does one receive moose meat, right?! It wasn't until a few days prior to my surgery that I finally had to have the moose burgers. I least I wouldn't have died on the operating table without having tasted what B. considers one of the best burgers around. The sliders I made were rather tasty so I was glad I did. After surgery I had very little appetite for much of anything, let alone moose. When I began chemo in February, eating became even more of a challenge as perpetual nausea kept me from eating most things and my taste buds became hyper-sensitive. Flavors that I once loved became repellent and all I wanted was meat. Following chemo treatments, odd and very precise cravings hit me. 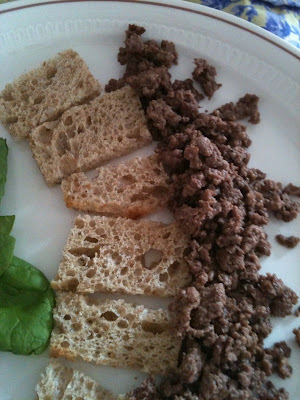 One of the first things I asked for was crumbled moose meat in a frying pan, with salt. As all we had was a hunk of frozen chopped moose, A. took it out into the backyard and hacked it into chunks with an ax. He took out one chunk and prepared it for me as requested, accompanied by toast points and garnished with spinach. It hit the spot at the time but I will never eat or want that preparation again. So back to the freezer went a all of the hacked moose meat. 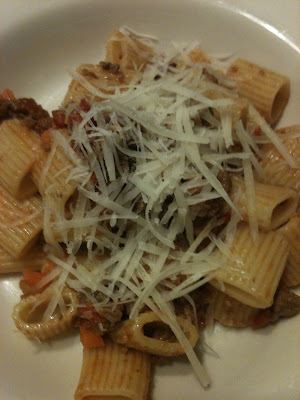 I knew that I had to use that moose meat before it suffered freezer burn and the other day I had a hankering for some pasta Bolognese, hence my idea for Moose Bolognese. I even had the energy to make it myself, using Marcella Hazan's already tried and true recipe. With moose meat, or without, give it a try for a comforting meal. I am so glad the moose is giving you some pleasure. I hope it will help you keep your strength up. If you crave more just say the word. It is only a days flight away!